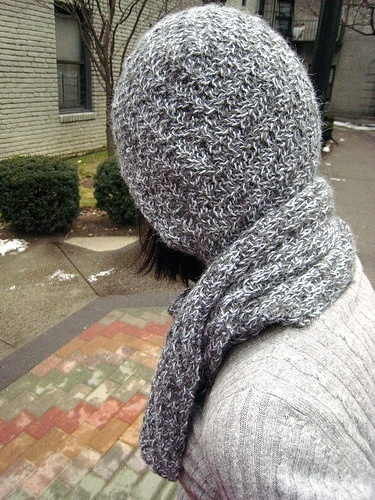 Posted in Finished Objects 2007, Hats, Scarves, Uncategorized at March 10th, 2007. Also, I have realized that the Addi Turbo’s points are good, because they are sharp enough to flip the stitches around, once I realized the error. Posted in Scarves, Uncategorized at January 16th, 2006. 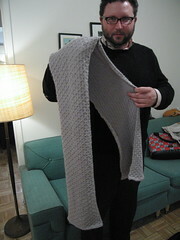 I am not such a big fan of these addis turbo that all the knitting bloggers love. This is because they are metal and do not bend, and thus, are a little bit uncomfortable. 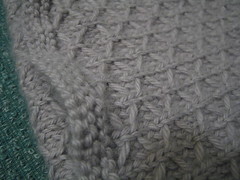 I can see why everyone says they are fast, and why they are called turbo, because they are pretty slippery, and for the plain knit stitches, do make the rows go by fast. The problem is that this pattern makes me have to think a lot, so I can’t go that fast anyway. 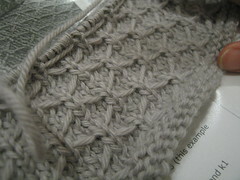 If I knit this again, I would probably do it on plastic needles. Also, don’t be a fool like me and buy 24″ circular neeldes, which are apparently only used for children’s clothes. Because I know no children. They might be useful for dogs though, and as mentioned earlier, will come in handy for any plain knitting done on size 5 needles because they really do make knitting fast, if kind of hard on the arm/wrist. 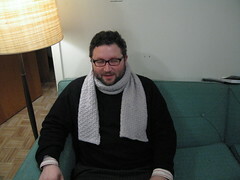 Posted in Scarves, Uncategorized at January 10th, 2006. I cast on 10 extra stitches than what the pattern used, and went down to size 10 needles (size 11 seemed so big, that it didn’t seem right) and thus, ended up needing another half a skein. Perhaps less if I had blocked. On hindsight, I might have attempted to use the size 11, because the stitch is kind of tight and might have looked nicer a little looser, but otherwise I think it’s fine. 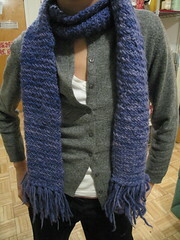 Posted in Finished Objects 2005, Scarves, Uncategorized at January 10th, 2006.